Most people think that higher octane in gasoline supercharges the combustion in an engine cylinder, giving them additional power and performance. It is this misunderstanding of what octane actually does which leads people to spend more on gasoline than they really need to. If you see a high octane rating for a given gasoline, what does that really tell you? That you'll get better mileage and more power? Or does it tell you something different? The octane rating of gasoline essentially tells you how much the air-fuel mixture can be compressed before it will spontaneously ignite. Gasoline with an optimal octane rating performs best in an engine designed to run on that octane level. Refiners aim to produce gasoline that has this optimal octane rating so it will meet the specifications for the most kinds of engines. That's what ethanol is such a big deal - it's partly used to increase the octane rating of the gas. Ethanol free gasoline has to have other things added to it to make up the octane difference. Inside an engine, you have the piston moving up and down, with the injectors metering a given amount of fuel into the combustion chamber as the piston travels up toward top-dead-center position. As it moves up, it compresses the fuel-air mix already in the cylinder. When the air fuel mixture ignites by the heat of compression rather than because of the spark from the spark plug, it causes knocking in the engine and a loss of power. The knocking sound is caused by two exploding "flame fronts" - one explosion from the pre-ignition of the fuel-air mix caused by compression and the other from the rest of the fuel-air being ignited at a slightly different time by the spark plug. The two flame front explode and send shock waves through the air of the cylinder, which meet in the combustion chamber and give you that annoying knock effect. 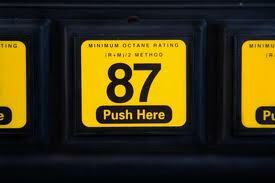 Lower octane gasoline like "regular" 87-octane gasoline can handle the least amount of compression before igniting. The compression ratio of your engine determines the octane rating of the gas you must use in the car. This is the same as saying your engine is designed to perform its best with a specific octane rating of gasoline. A "high-performance engine" has a higher compression ratio and requires higher-octane fuel to prevent it from prematurely igniting fuel before the spark plug does it. So, octane does not enhance the explosion in the cylinder like most people think. What does octane do? It just prevents the air-fuel mixture from igniting before the spark plug does it. Firing the air-fuel mixture at the proper time gives you the maximum power your engine was designed to get. Using higher-octane gasoline than your engine is designed to utilize is only wasting your money. Does oil change affect performance? Octane and Mileage: Does low octane hurt your gas mileage? This post was published on January 20, 2012 and was updated on February 4, 2016. Gas mileage up, greenhouse gases down. And there was much rejoicing.